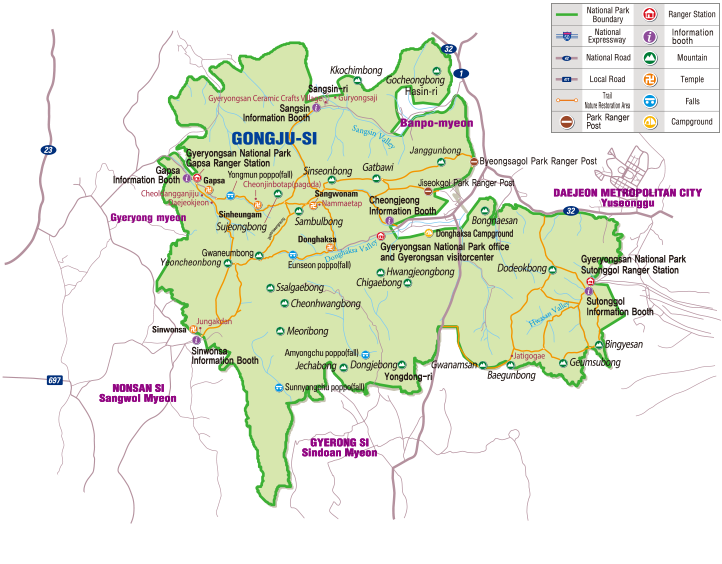 Gyeryongsan National Park was designated as the 2nd national park in Korea in 1968. Gyeryongsan National Park spreads across Gongju-si, Gyeryong-si and Nonsan-si in Chungcheongnam-do and Daejeon Metropolitan City over a total area of 64.71㎢. Gyeryongsan has about 15 valleys in between its 20 peaks based around the summit Cheonhwangbong(845m). The mountain is called “Gyeryong(Rooster dragon)” because the ridge line looks like a dragon wearing the crown of a rooster. Gyeryongsan has a snug appearance and is kaleidoscopical. It is crowded with visitors all year round because day trips are possible from metropolitan cities such as Seoul and Daejeon. Because of its excellent Feng Shui(Theory of divination based on topography)characteristics, Gyeryongsan was argued as the capital of Joseon Dynasty and it is a holy mountain where religious services took place. Gyeryongsan National Park has native broadleaves such as the Zelkova, Japanese snowbell and Mongolian oak as well as other natural plants such as the Birch and Pine. A total of 1, 121 plant species have been reported. As for animals, Gyeryongsan has 1,867 insect species and 645 animal species. Otter, Small-eared cat, Marten, Common buzzard, and Black woodpecker are a few of the 11 endangered species that live here.